Reading with a print text and a print lexicon is as basic as it gets. This is the way I read today, but like all the other ways of reading, it has its benefits and haunting feelings of guilt. There is freedom here. No notebooks on the table, no pens to refill with ink, no laptop or tablet needed. Just a text and lexicon. When reading this way, I prefer to use a concise lexicon. So on the table I would have BHS and The Concise Dictionary of Classical Hebrew, NA28 and Danker’sConcise Greek-English Lexicon of the New Testament, or Rahlfs and Muraoka or LEH. Sure, Muraoka claims to be a “fully-fledged lexicon,” but it better fits my expectations of a concise or intermediate lexicon. 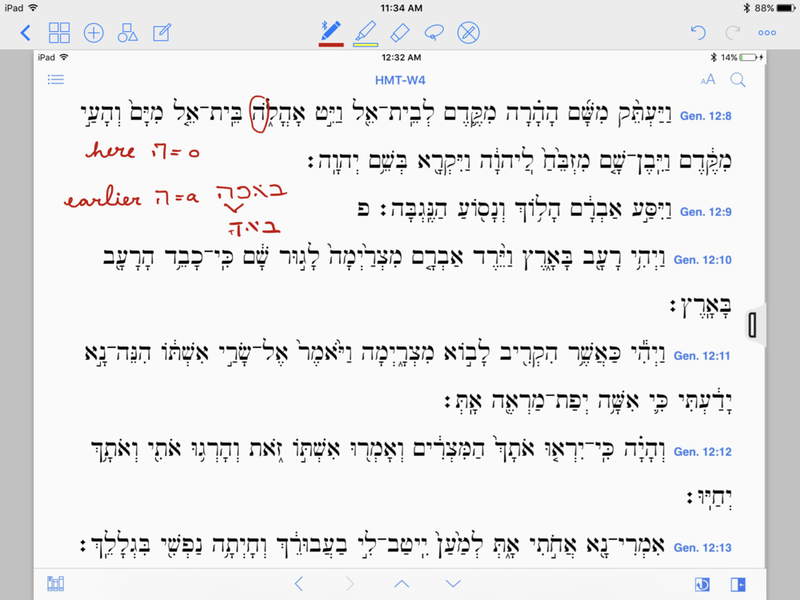 For Biblical Aramaic, Vogt and Fitzmyer is great. When a more comprehensive lexicon is needed, I will generally open an electronic version of HALOT, BDAG, or LSJ. If I’m home, BrillDAG is always handy. This is a reading workflow that minimizes distraction because only rarely will the concise lexicons be unable to answer whatever vocab related questions that arise. I’m able to forget about everything else and be more immersed in the text. In addition to the lack digital distractions, there is also the fact that I don’t have to worry about taking notes. When you take notes on everything you look up, the reading experience can turn into more of a note taking experience. When you close the books, it doesn’t feel like you have just stepped out of the wardrobe, but out of the classroom, where the teachers are dead lexicographers. Of course, reading this way also forces me to think through the morphology of forms and not rely on digital helps to parse words, but I do this no matter how I read. I have never made digital resources crutches. I don’t personally know anyone who has. I think many who recommend a completely analog way of reading do so for fear of “digital crutches.” While this is no doubt a legitimate concern in a seminary classroom filled with students juggling family and church and work and academic schedules, anyone reading this far into this post should probably shirk such feelings of guilt. You are sufficiently dedicated to reading texts in their original languages that any sort of guilty feeling concerning digital crutches is misplaced guilt. Reading with print text and lexicon encourages me to linger a little longer over the lexicon entry. I want to remember the word’s semantic range next time I come across it, and I am not taking notes I can look back on. In a related line of thought, I’m also not dependent upon the gloss provided by a reader’s text. I can get the full semantic range every time I look up a word — or at least the full semantic range a word has in a given body of literature. If I’m working with a good concise lexicon, at a glance I will also see all the forms of the word or at least its principal parts. Finally, this way of reading will work with any language or body of literature. You don’t have to wait on someone to make a reader’s this or that. As long as you have a text and lexicon, you are good to go. This way of reading is a little slower than reading with a reader’s text and faster than reading with paper and pen, but is it a happy medium? Well, it is hard to shake the feeling that I should be taking notes on everything I look up, but I think it is. Using a print text and lexicon is a solid way of reading, and the benefits far out weigh the negatives. I think I was first encouraged to read this way by Charles Halton in a Hebrew exegesis class, but I haven’t spent as much time with this MO as others. I’m going to continue reading this way over the summer, but you read however you want. Compared to Greek, I think it takes about twice as long to make it through the elementary grammar phase of learning biblical Hebrew. This is discouraging for many students. I know it was for me. If you are struggling with first or second year Hebrew, just know that this is normal — you’re OK.
Why is Hebrew so much more difficult? Morphology. Think about how much time you spent on morphology in your Greek classes compared to Hebrew. Some spend an entire year on Hebrew morphology before moving on to syntax. Others have a more balanced approach, but all spend more time on Hebrew morphology than Greek. We are not teaching one language, but two; if we emphasize the accents, make that two and a half. We demand that our students understand and replicate an elaborate cellophane overlay that is more complicated than the language it attempts to clarify. Griffin has written a grammar that de-emphasizes the vowel points, Hebrew for Reading Comprehension. I could not find a print copy online, but the grammar is sold by Logos and Griffin has a website devoted to it where you can check out some samples. I don’t know if this is the answer or not, but I am intrigued. I was never able to master all the morphological rules for weak verbs though I certainly gave it my best effort. I have multiple notecards for every chapter of Fuller’s grammar, and I think I’ve gone through the book from cover to cover three times. It just doesn’t stick, and I’m OK with this. I can read Hebrew, and if I need to look up some rule on weak verbs, I know where to turn. If you struggle with Hebrew, grace and peace to you. Don’t listen to that little voice coming from your skewed grammatical conscience that says, “You can’t start reading your Hebrew Bible if you can’t recite all the rules for germinate verbs. That’s cheating!” Read. Keep at it, and know that you aren’t alone. Hebrew just takes longer, and the fog doesn’t start to lift until you start reading. I’ve spent a lot of time with reader’s texts, and I even helped publish one. I wanted to share the journey and what I think about this way of reading. My journey began in 2008, when the first edition of the UBS Greek New Testament Reader’s Edition was hot off the the press. I loved it because it’s typographically easy on the eyes — so much better than the Zondervan edition available at the time — and it also includes parsing information for more difficult forms. The parsing information allowed me to stay in the text; it eliminated the need to open a computer program to check the parsing of irregular forms. I was one year into Greek and could not wait to start reading. Reading through the UBS GNT laid a solid foundation of vocabulary knowledge that made reading the text more enjoyable and beneficial. I’ve never done this for the Hebrew Bible, and sometimes I wonder if this might be why I am drawn to reading Greek so much more than Hebrew. Zondervan released individually bound reader’s texts, as well. In fact, they got the ball rolling. The first edtion of their Reader’s Greek New Testament was incredibly thin and portable. I didn’t begin using it until it was released in a second corrected edition; it’s now in a third. I bought Zondervan’s Reader’s Hebrew Bible shortly after it was released in 2008 and used it some, but I never really liked it. The font is too large, the word spacing seems weird, and there is no parsing help. After the UBS Greek New Testament, the next edition I spent significant time with was Zondervan’s Reader’s Hebrew and Greek Bible. For several months this was my go-to text. Unfortunately, the GNT has typography issues, too, and when you bind both of these together the issues are even more pronounced. The Greek is too small and light, while the Hebrew is too big and very bold. It is so convenient, though, to have a reader’s GNT and Hebrew Bible bound together that I was willing to overlook the poor formatting. This is the Bible I would take to church, and no matter what the sermon was on, I had a text ready to roll. I gave away both individually bound Zondervan volumes — the Reader’s Greek New Testament and the Reader’s Hebrew Bible — but I still occasionally use the Reader’s Hebrew and Greek Bible. I also ocassionally use the third edition of the Reader’s Greek New Testament for a few reasons. The third edition is as slim as ever, and the font has been updated to the Zondervan Greek font you find in their most recent publications. In our Greek 3 NT Readings class at HLS, we use the Zondervan’s third edition and this 2011 edition of the UBS Greek New Testament Reader’s Edition, which we bought really cheap shortly after the UBS5 reader’s text was released. In 2014 and 2015 Hendrickson and the Bible Society released Biblia Hebraica Stuttgartensia A Reader’s Edition and the UBS5 Greek New Testament Reader’s Edition. Both are beautiful. The black Flexisoft versions look and feel very similar. The text is updated from UBS4 to UBS5, changing in 33 places. The dictionary in the back has been updated to reflect the 2010 version of Barclay Newman’s Concise Dictionary of the New Testament. The cover has a soft back leather-like feel. The font is a bit more clearly rendered. The font is SBL Hebrew. The text is laid out in a more natural way. The footnotes include a concise parsing code. All Hebrew verb paradigms, strong and weak, are listed in the back just before the dictionary of more common forms. The pages are thick, like the UBS5 GNT, which means there is hardly any bleed through. The pages are a pleasure to flip through. The parsing code comes with a learning curve, but it didn’t take but a day or two to get the hang of it. I use these reader’s editions from time to time and love them. Just this evening, I was letting my kiddos run in the back yard before bedtime. I couldn’t go into a full blown text-lexicon-notebook type reading mode. That would have required more focus than I could give. Had to keep an eye on my little trampoline-bouncing acrobats. I was, however, able to comfortably read through a chapter of Genesis with just the BHS Reader’s Edition, even while refereeing various disputes and tragedies such as the time when Peppa Pig was trapped under the car. I could sit with one book in my lap, be immersed in the text, and glance down to the bottom of the page for whatever vocab or parsing I wanted to check. Reader’s texts aren’t for every situation. You can catch some serious judgment if you’re caught with one of these things in certain academic environments. Some think that everyone toting a reader’s text is a cheater, a lazy person who doesn’t have what it takes to really learn the languages. I emphatically disagree. I know how much it helped me to read through the GNT for the first time with a reader’s text, and I know that I don’t lean on these things as crutches. I have notebook upon notebook, physical and digital, full of voab and grammar notes that testify to my willingness to “do it the hard way.” But as I described above, there are times when a reader’s text is just helpful given your circumstances. Sometime you just want to sit down and read. The name of this type of Bible is quite fitting — reader’s. This judgment issue is part of the reason I’m writing these posts on different ways of reading. I’m stuck at a bit of a crossroads concerning how to move forward so I’m writing about it. I’ll continue to read in all the ways I describe. Maybe I’ll settle in to one way for a year, but experience tells me that it won’t last forever. Read however the mood strikes you. Just read. Bible Odyssey: What is the Oldest Bible? I wrote an article for Bible Odyssey answering this question. Bible Odyssey is an online initiative of SBL intended to communicate the results of scholarship to a popular audience. The article is a response to several user questions related to the issue of “oldest Bible.” I tried to explain that the answer depends on what one means by “oldest” (materially? textually?) and by “Bible” (a bound book? Protestant? Catholic?). On the bottom right of the page there is also a related links section where I provide links to a few of the manuscripts and editions mentioned in the article. A Bible text, a fountain pen, and several colorful notebooks — for a couple years I hardly every left home without them. When I would read, I took vocab and grammar notes in these wonderful little Leuchtturm 1917 pocket sized notebooks. The pages are numbered and take to fountain pen ink really well, and the binding is rock solid. They are beautiful, perfectly portable, and a just a pleasure to use. Taking notes while reading has been a normal practice for years. I usually write down something for every word or grammatical construction that I look up. The purpose is to have a record of what what I’ve found by flipping through the lexica and to make rereading quicker. I find it more enjoyable to reference my notes via these Leuchturm notebooks than any sort of digital medium. There have been several times, though, when I wanted to read and did not have handy the particular notebook I needed. There were times when I would run out of ink, and God forbid I use a different color or pen type. Sometimes I would have an acceptable backup non-fountain pen handy and could convince myself to use it, but this always felt wrong. The size of the notebooks, while definitely scoring points for portability, is not exactly ideal for comfortable writing. Unless I’m at the top of the page, my hand is usually halfway on and halfway off the notebook. I suppose the biggest drawback to this mode of reading is that it is really only doable at a desk or table. If you care at all about handwriting and actually wanting to produce something you will want to look at in the future, you have to be in a position where you can set out your text, lexicon, and notebook and position yourself to write carefully. Everyone likes the idea of reading in a comfortable chair or on the couch, and you just can’t do this very well with the text and notebook approach. Maybe it would be doable if I chose a bigger notebook, but then portability suffers. 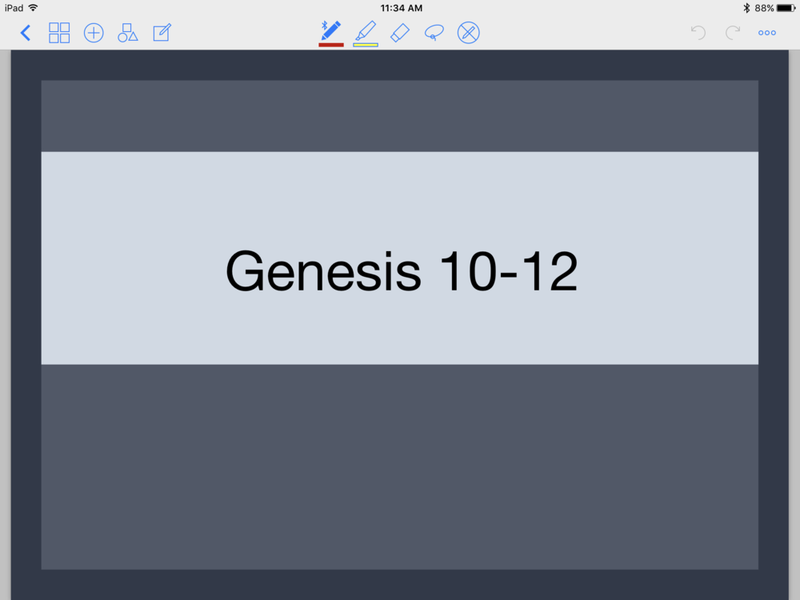 When I take reading notes now I turn to digital notebooks — I’ll post about that later this week. There is, however, one recurring thought that I feel is trying to pull me back to the little notebooks: the kids love them. They love small books in general but especially these. They think of these notebooks as kiddo-sized and appropriate for them. They just want to sit and flip through them and carry them around the house wherever they go. While I’ve always found their fondness for my vocab books cute, the more important thing is that the little colorful notebooks have made an impression upon them. Maybe they will be more likely to one day learn the languages themselves, but even if they never read a word of Hebrew, these little books will remind them of me. This was the last week of our Hebrew reading group. The purpose of the group was simply to encourage students to read Hebrew during their break. The goal was to come each week having read three chapters in Genesis, to bring a question or two, and to be ready to translate when called on. On average 5-6 students came, and in my opinion this was a win. The smaller size of the group created an atmosphere where everyone felt comfortable asking questions and making comments. It would have been fun to have 20 come each week, but for the most part we met in July and we were reading Hebrew. If few seminarians actually learn to read and enjoy Greek, then a minuscule percentage do the same with Hebrew. Each week I took screenshots of the text in Accordance’s iOS app, and I compiled a notebook of the images in GoodNotes. I cast the screen of my iPad to a TV on the wall using AirPlay. When a question arose, everyone was able to look up and see me annotate the images to illustrate the explanation I or another student offered. All this took place in GoodNotes. I was able to sit at the tables with students and facilitate, but when the time came to teach, instructions could be given in a way that all could easily see. This method of facilitating, I think, was another factor that contributed to the comfortable atmosphere and the open discussion we were able to have, despite the wide variety of Hebrew reading experience in the room each week. I hope the library continues to allow us to do these Greek and Hebrew reading groups each summer. It was my pleasure, and the students seemed to be encouraged, as well. Just a reminder that our summer Hebrew reading workshop starts tomorrow morning at 8-9am (Mullins room, library 3rd floor). Accordance has a new unicode font in the works. It includes characters for English, Greek, Hebrew, Syriac, and more — even DSS transcription like you see listed here. And it includes bold, italic, and bold-italic. They announced this on the Accordance forums. Unfortunately you need a forums account to see the page. Now if that qamets would just slide a bit to the right underneath the daleth, like this אָדָם. Here is a PDF where you can see more of the characters included.